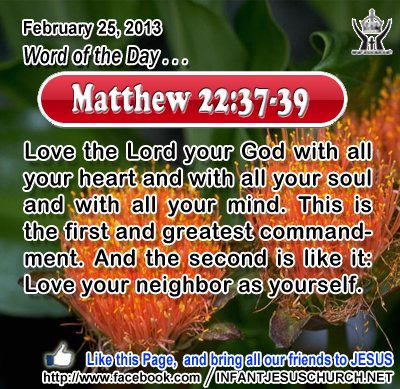 Matthew 22:37-39: Love the Lord your God with all your heart and with all your soul and with all your mind. This is the first and greatest commandment. And the second is like it: Love your neighbor as yourself. Heavenly Father, Please accept the work of our hands, the words of our mouth, the moments of our rest, and the love of our heart as our worship to you this day. We pray that these are pleasing and refreshing to you. In the name Infant Jesus, we pray. Amen. 36Be merciful, even as your Father is merciful. 37"Judge not, and you will not be judged; condemn not, and you will not be condemned; forgive, and you will be forgiven; 38give, and it will be given to you; good measure, pressed down, shaken together, running over, will be put into your lap. For the measure you give will be the measure you get back." What makes true disciples of Jesus unlike from those who do not know the Jesus and what makes Christianity distinct from any other religion? It is grace - treating others not as they justify, but as God wishes them to be treated – with loving-kindness, forbearance, and compassion. God shows his goodness to the undeserved as well as to the just. His love embraces saint and sinner similar. God always seeks what is best for each one of us and he teaches us to seek the most good of others, even those who hate and abuse us. Our love for others, even those who are unappreciative and unkind towards us, must be marked by the same compassion and mercy which God has shown to us. It is easier to show sympathy and mercy when we can expect to advantage from doing so. How much harder when we can wait for nothing in return. Our prayer for those who do us ill both breaks the power of vengeance and releases the power of love to do well in the face of evil. Loving Infant Jesus, your love brings freedom, pardon, and joy. Transform our heart with your love that nothing may make us lose our temper, ruffle our peace, take away our joy, or make our bitter towards anyone.